National Centre for Aerospace Innovation and Research (NCAIR) is a collaborative consortium of the Indian aerospace manufacturing sector providing research and technology to its members with a vision to create a world class aerospace manufacturing ecosystem in India. 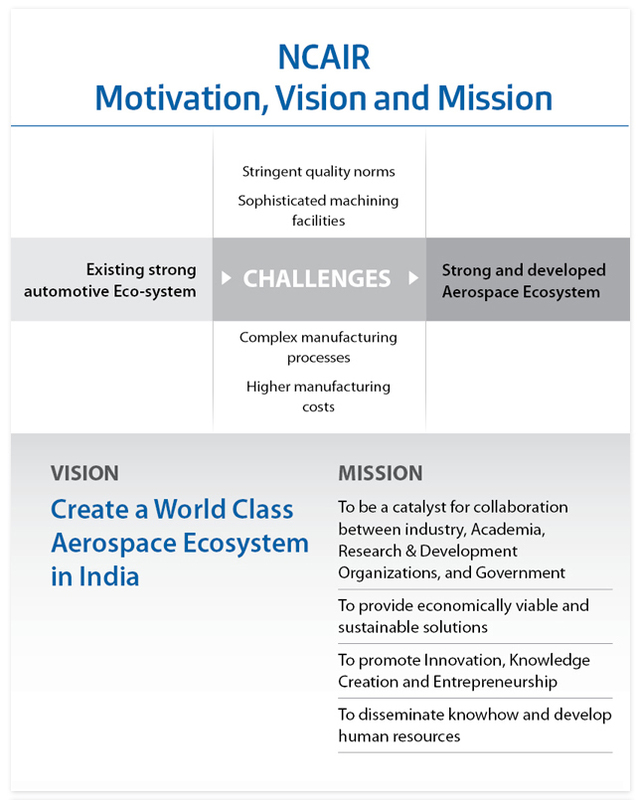 It serves as a catalyst for collaboration between Industry, Academia, Research & Development organizations, and Government with an aim to provide economically viable and sustainable solutions to the Indian aerospace manufacturers by promoting Innovation, Knowledge Creation, Entrepreneurship, and Dissemination of know-how. The NCAIR is developed on IIT-B's decades-long history of metalworking and manufacturing expertise and innovation in addition with Boeing and DST's appropriate support. The initial idea to create a centre for development of Aerospace ecosystem in India through innovation and research was conceptualized during discussions between Boeing and DST in 2009, following the visit of Dr. Ramasami, Secretary of the DST, to Bangalore for the inauguration of Boeing Research and Technology-India Center. This idea was conceived as a collaborative consortium of industries aspiring to be a part of the aerospace sector to provide stimulus to the evolution of a vibrant aerospace ecosystem in India. During late 2009, IIT Bombay, which has a track record of successfully implementing similar initiatives of national importance accepted the invitation to host and pledged complete support to for the idea. Eventually, IIT-Bombay set up the National Centre for Aerospace Innovation and Research (NCAIR). The Governing board was formed and had its first meeting on 3rd November 2010. It was decided that IIT Bombay would provide infrastructure, domain expertise and complete operational and leadership support. Boeing would provide a combination of direct funding, critical technical support. Department of Science and Technology, Government of India would provide the necessary seed grant for the realization of NCAIR. Accordingly, agreements were signed between IIT Bombay, DST, and Boeing to establish NCAIR in 2010 with initial funding of around Rs.20 Crores. Become a member. Click here to Sign up!